My parents were hosting a brunch the day after the stateside celebration of my cousin EM and Kristina’s wedding, and my mom was all, “Just bring something over that everyone will like. Brunch starts at 11.” So, since A. I planned on being mildly hungover B. I love sleep, especially on the weekends, more than anything, and C. I still wanted to make something good, I started searching for make-ahead brunch meals that I could put together the night before and just throw it into the oven the next morning. 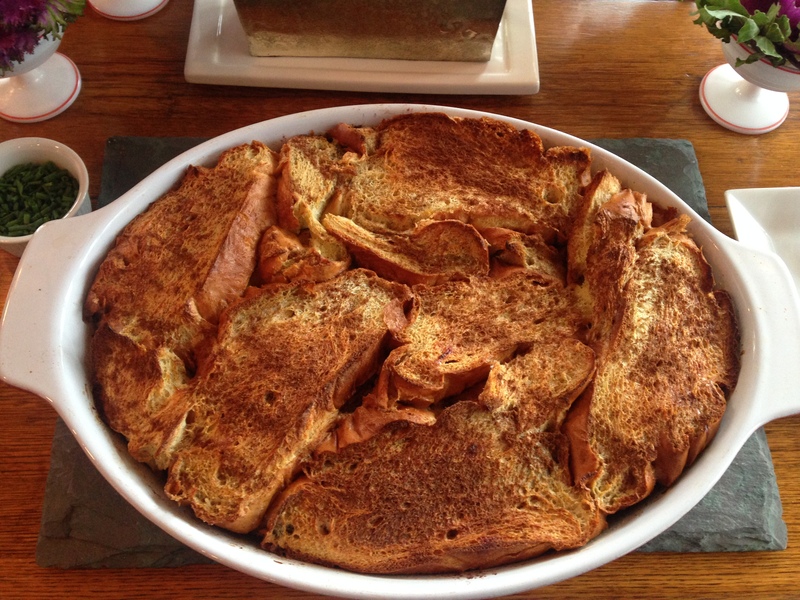 When I found Smitten Kitchen’s “boozy baked french toast,” the words read like a song. This was the one. I love Smitten Kitchen, and I love anything that tastes this good with minimal effort, and I especially love the post-event rehash with some of my favorite trash-talkers (my family). If you’re looking to throw together something that requires little effort the day before, but is hands-down amazing – and also may or may not soak up your New Year’s hangover – this french toast is here to save the day. This entry was posted in breakfast, french toast, friends and family, hostessing, love and tagged brunch, french toast, friends and family, hostessing on December 30, 2014 by westyn. For years I thought that French Toast was my least favorite breakfast food (sorry Mom). But then my sister invited me over for brunch and made this sensational French Toast, and it changed my opinion completely. I think, like with most simple recipes, the difference comes from really good quality basic ingredients. Collyn brought me home some ridiculous bread from Penn State on one of her work trips, so I used that, and then milk and eggs from Hillside, this really great vanilla, etc. It ends up being sort of a custardy, breakfast-y French Toast/Bread Pudding, which is obviously the best dessert of all time. I would wake up early to make this, and for how much I love sleep, that’s saying a lot. – 1/2 a loaf of really good bread, sliced thick. 1. In a pretty big bowl, beat the eggs. 2. Add the milk & cream, then the vanilla. Then add the cinnamon, nutmeg, ginger and a pinch of salt. 3. Whisk this mixture well. Soak the bread slices in this mixture as you melt the butter. 4. In the largest skillet you have, melt the butter over medium low heat. Here’s the secret – ready? You have to cook these really, really slowly. The french toast should kind of swim in a little pool of custardy deliciousness, slowly forming a golden crust, over maybe 10-15 minutes in total (flip 2-3 times during this process). 5. When French Toast is ready, keep warm in the oven on low heat while you make the other batch. 6. Serve with maple syrup and enjoy. Even Brendan couldn’t eat more than 3 pieces, he was so full. Finally that 24 year old metabolism has met its match!!! This entry was posted in breakfast, family, french toast on June 4, 2014 by westyn.